Expert tip: This is one of the most popular yoga retreats offered in Mexico. Travel and surf to your heart's content! Come with Experiencia Puerdo Escondido to the surf trips to the best hidden destinations and surf spots of Pacific Mexico. Get inspired to enjoy this world in the water and outside with like-minded people as you delve into your yoga practice and learn to ride the wild waves. Join Experiencia Puerto Escondido "Surf Insight" package and enjoy comfort, cleanliness, and safety! Experiencia Puerto Escondido's new surf camp building is just a few steps from one of the best places to surf in Mexico, La Punta of Zicatela. Enjoy comfort, cleanliness, and safety! You will be staying in private or shared rooms, and have access to hammocks and a common equipped kitchen. Free Wi-Fi is also available in the rooms and common areas. Please note that Puerto Escondido is one of the safest resorts in Mexico. Also, the school premises are video recorded 24/7, with night guards in both places. 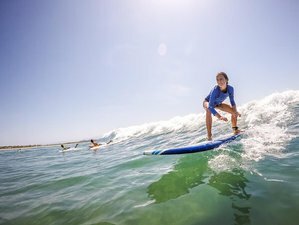 During this six-day "Surf Insight" yoga and surf camp, you will have five surf lessons in total. All classes are two hours long. The classes include theory, warm-up, and practice in the water. Experiencia Puerto Escondido guarantees good surf equipment and experienced surf instructors for all of the students. The surf class lasts for two hours: warm-up (five to ten minutes) and surfing and warm-down (five to ten minutes). The morning class is from 8:00 a.m. to 10:00 a.m. and the afternoon class is from 3:30 p.m. to 5:30 p.m. The surf lessons are for students of all levels - from beginners to intermediate and advanced. You can relax after surfing. There will also be three yoga classes for you. Yoga classes usually take place every Tuesday, Wednesday, Thursday, and Sunday from 6:00 p.m. to 7:00 - 7:30 p.m. The yoga style that will be practiced is Hatha yoga, intended more for beginners and aiming to relax after an intense exploration or surf day. Please note that there are waves suitable for learning all year round in Puerto Escondido, and the water is almost always very warm. Sometimes big waves come to the home surf spot in May and June. In this case, Experiencia Puerto Escondido uses their school bus to go to another spot where the waves are not big and it is good for beginners. Please also note that the water is completely safe, but sometimes you will be lucky to surf together with sea turtles! This surf camp will take place in Puerto Escondido, Mexico. A reservation requires a deposit of 17% of the total price. Experiencia Puerto Escondido offers the best way to learn Spanish - to experience life! They offer surfing and Spanish lessons on all levels.